Congratulations to our new IAM Officers! Food stalls with lots of mouth watering home made foods. Hope you all had wonderful holidays.As the new year 2017 has approached we are glad to announce our events of the year. What’s the next IAM event? 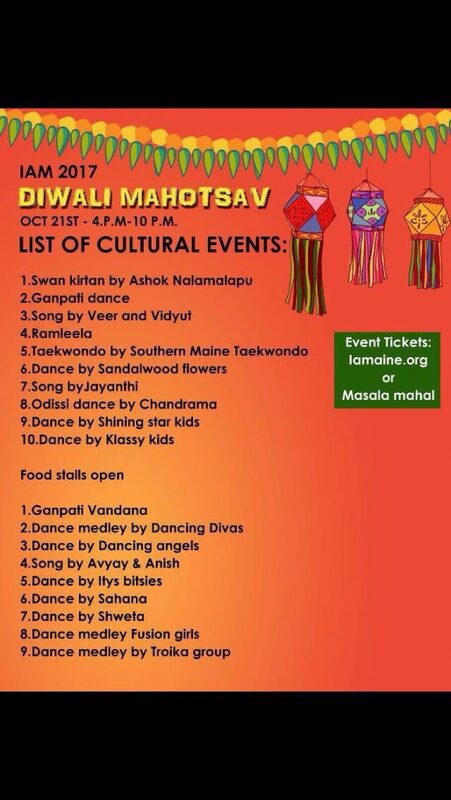 Diwali Mahotsav.. this Saturday! 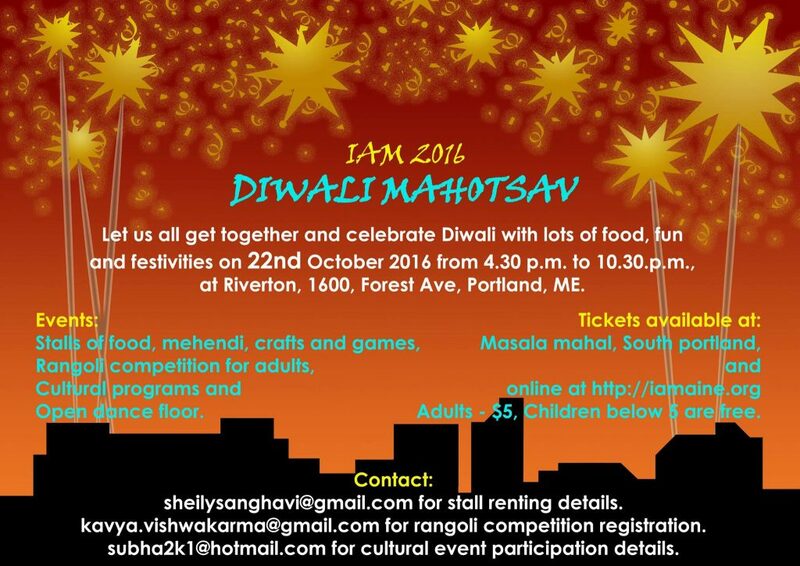 Ticket Sales have closed — Diwali Mahotsav has sold out! It’s again the festive season of the year!!!! 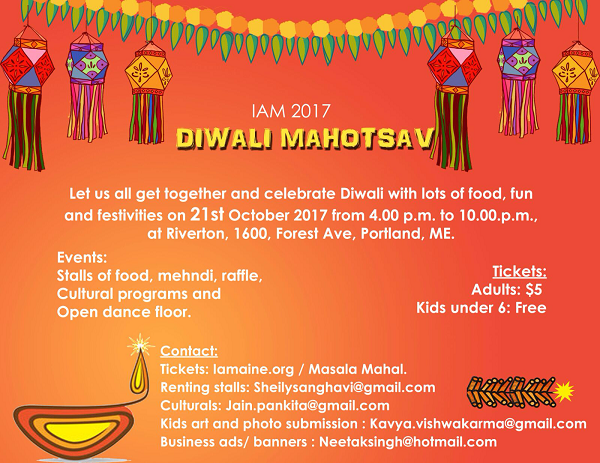 After the grand success of Vasant Mela, IAM is thrilled to host yet another fun filled fair, “Diwali Mahotsav”, a place to showcase the diversity of Indian culture and celebrate Diwali together. Tickets: $5 per person and free for kids under 5. A mela style celebration involving the entire Indian community to make this occasion more joyful. So gear up to prepare and sell your favorite homemade food or your masterpieces of art. We will also be conducting cultural program for your entertainment. So get ready to show your talents in our stage!!!! And how can a celebration complete without a DANCE ? Well you guessed right!! After our cultural fest, we will be having an open floor Garba for everyone to dance their heart out!! So what are you waiting for? Come over for a sparkling celebration and a grand feast. Do join us to make this Diwali Mahotsav a special one!!!! NEW: Anaca Gooje is all set to choreograph dance for couples which they can perform later in the cultural show!!! Biography: Anca Gooje is a teacher and performer of Bharata Natyam and other forms of Indian dance. Anca received a prestigious scholarship from ICCR, the Indian Council for Cultural Relations, to study Bharata Natyam professionally. She spent five years as a full time student of renowned Guru Jayalakshmi Eshwar, performed her Arangetram in 2006, and participated in many events featuring Indian classical (and folk) dance, as well as dramas. Since 2009 Anca has made Maine her home, where she lives with her family and teaches. For more details visit www.ancagooje.com or email Anca at ancadances@gmail.com. 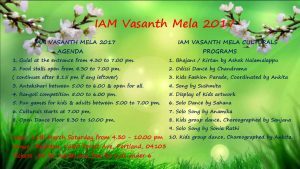 IAM is gearing up to host the Spring Festival in the form of Indian fun fair Vasant Mela, a treat for your taste and talent. We have planned to bring together and involve the entire Indian community at Vasant Mela to showcase their culinary and artistic skills. Bring your homemade regional food or your signature dishes or your master pieces of art to sell and make profits at the Mela. We have 12 stalls available for rent at $50; 10 stalls for food, clothes, jewelry, arts and crafts, one stall for mehandi stall and face painting each.Don’t have time to bring your stuffs to sell but still want to advertise your business? We have plans, we are providing space for marketing banners for $25.We also have Rangoli competitions and cultural programs to entertain you after closing the stalls. Kids will also have non-stop fun with Games and bingo throughout the Mela. Anokha is all set to choreograph dance for couples which they can perform later in the cultural show!! !Hurry up folks!!! This is a great opportunity to get connected and to promote your talent or business!!! Tickets: $5 per person and free for kids under 6. 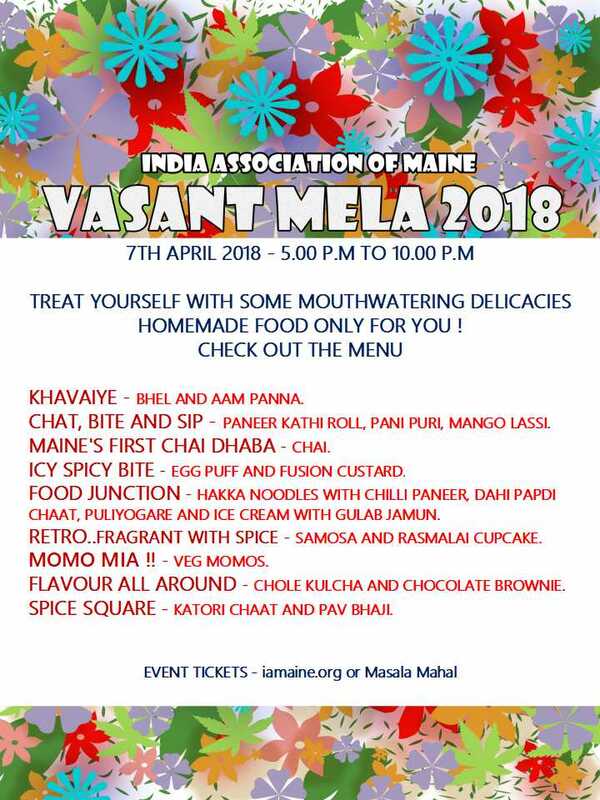 Join us to make Vasant Mela a grand success!!!! Please print and bring the payment confirmation email from Paypal as your ticket. Thank you. Diwali Dinner ticket sale is closed now. Thank you for buying your tickets early. 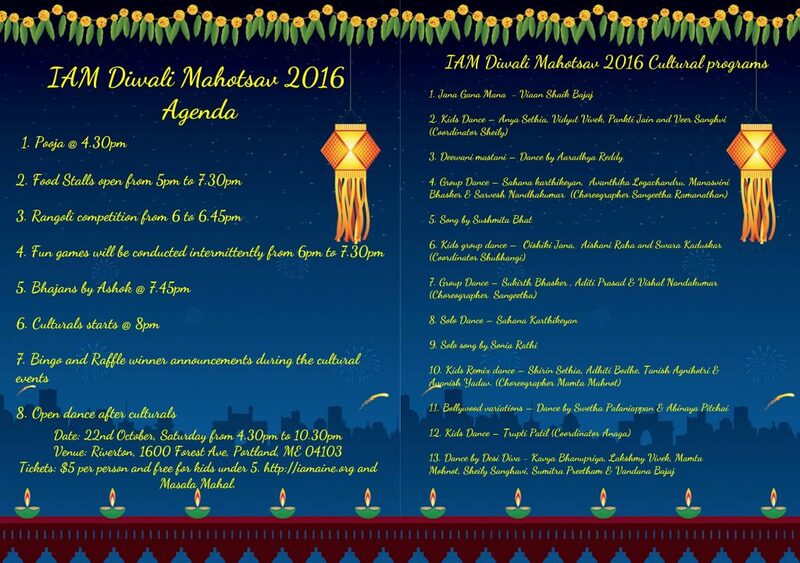 Diwali Utsav – Festival of Lights celebration on Saturday, November 14th ! 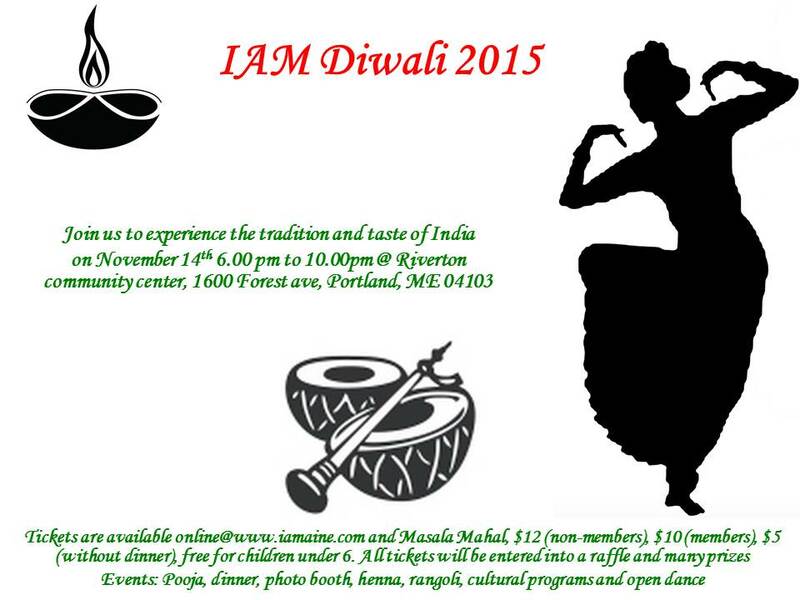 The 2015 Diwali Utsav event at Riverton Community Center, Forest Ave. Portland from 6 PM to 10 PM. 9:00 Bingo followed by open dance. Rangoli competition and Mehendi stall open throughout the evening. Tickets available at IAM website and Masala Mahal. All tickets will be entered into a raffle and many prizes. 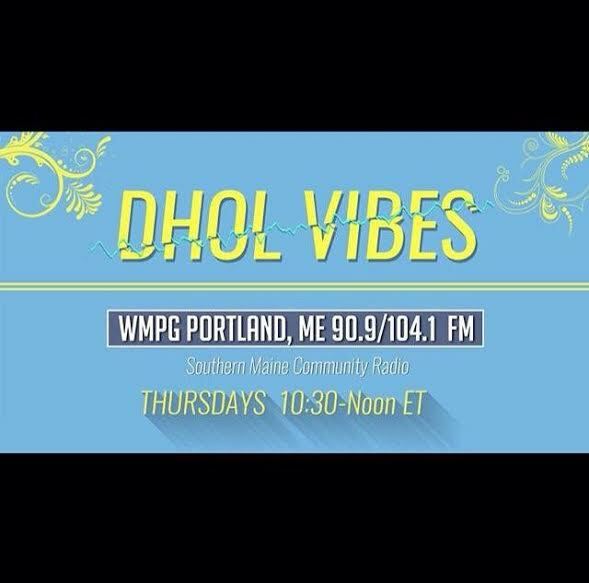 Maine Hindu Temple is celebrating Lord Krishna Janmashtami on September 5th. The birth of Lord Krishna is celebrated as Janmashtami. MHT cordially extends invitation to you along with your family and friends to attend the auspicious occasion of Lord Krishna Janmashtami celebration. We are sorry to inform you that due to unforeseen scheduling conflicts with other local events and limited participation, the 2015 Spring Festival scheduled for Saturday May 9th is canceled. We considered many options including rescheduling and changing the event format but due to the short window of opportunity this was not possible. We will refund online ticket purchases through Paypal. If you have purchased your tickets at Masala Mahal please stop by there. 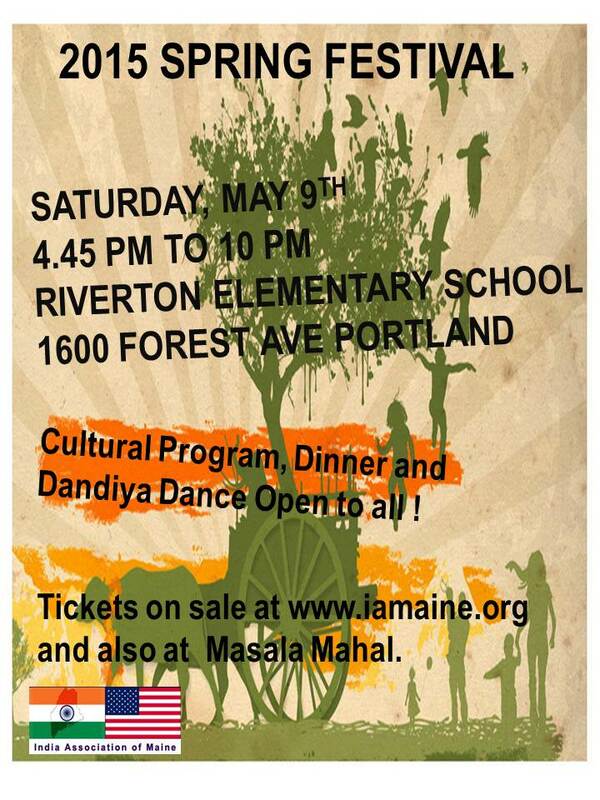 These events are intended to bring together the Maine India community through cultural programs and food. Your participation is essential to sustain it. Please email us your feedback or questions. Spring Festival 2015 Tickets are on sale now ! Please buy your tickets early. Tickets will not be sold at the event. 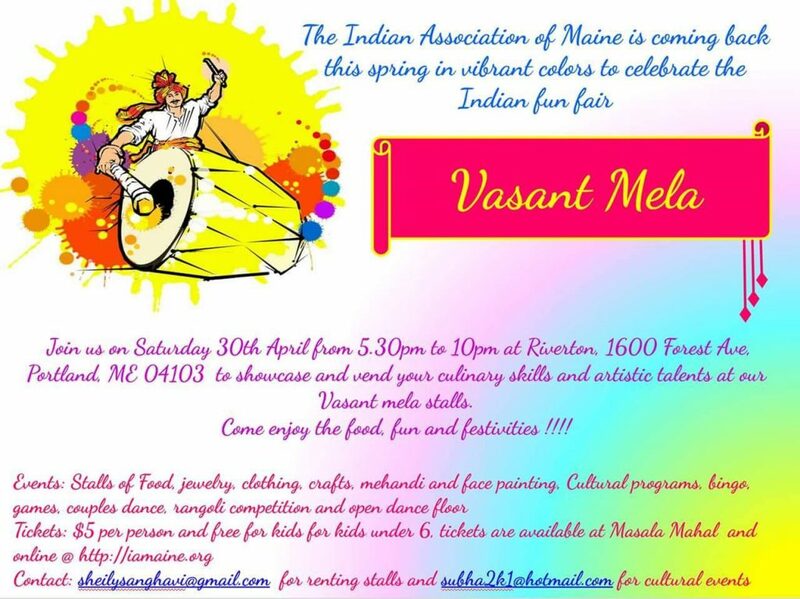 Join India Association of Maine and get discounted event tickets for the 2015 Spring festival. Your membership is valid until September 2015. We are excited to announce the 2015 Spring Festival on Saturday May 9th, 4.30pm to 10pm at the Riverton School. There will be a cultural program, dinner and dance ! March 12, 2015, 6 p.m. Please join us a warm, fun evening to informally gather and socialize! 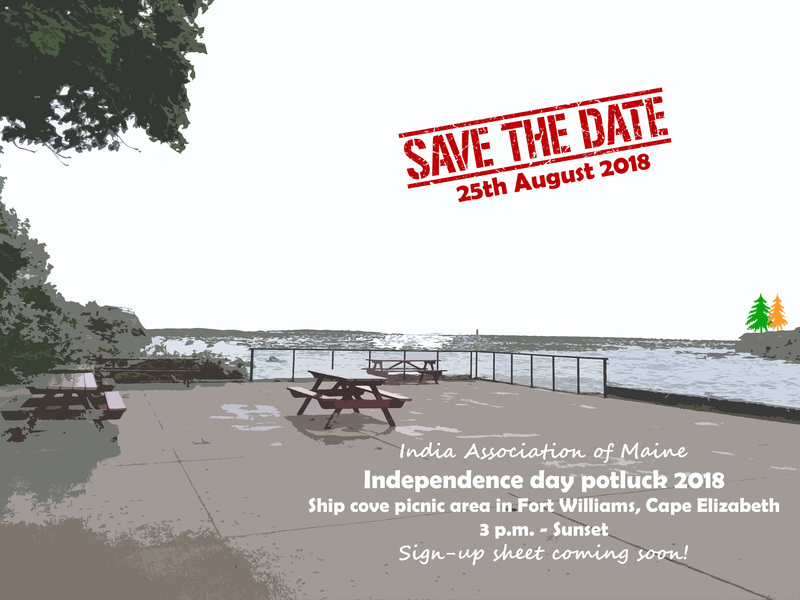 This is a great way to meet other Indian families in Southern Maine. Bring something to share and enjoy some chai. We have a book club – Family Life: A Novel by Akhil Sharma. We will meet on, Friday, February 27th – 5.30pm to 7.30pm. at Room 102 Wishcamper Center, USM Campus, Portland. The Children’s museum in Portland has organized an exhibit on Bharata Natyam and its music/rhythms which will be inaugurated this Sunday, February 15th at 11 am. Anca Gooje will perform some Bharata Natyam dances, offer a short dance class and there will also be refreshments. The event is free for museum members and with museum entry. To encourage a wide participation of the local Indian community, Anca has been offered a LIMITED number of passes for the day. If you would like to attend the event and would like a free entry pass, please email Anca at ancagooje@gmail.com or call her at 207-200-0755 by this Thursday with the full name of all attending persons. Children under 18 months have free entry. Anca will make a list on a first call/first serve basis.This is a special event with a focus on Indian culture at the Children’s museum, thank you for your support! We had a good volunteer event at the Preble Street Soup Kitchen on Saturday, December 20th. Thanks to Sneha, Curran, Ritvind, Raji, Charu and Neeta for helping at Preble Street. More details of future IAM local community volunteer opportunities to follow. If you would like to recommend and lead other future volunteer events, please contact us. As we head into the holiday season, come join us and give back to your community. We will be volunteering at the Preble Street Soup Kitchen on Saturday, December 20th, from 10:30am to 1.30pm. You can make this a family event, children must be at least 13 to volunteer. We hope that you can join us on December 20th, please contact us by email to be added to the volunteer list. A BIG Thank you to all the early ticket buyers. Your timely action goes a long way to better organize the event ! Thank you. There will not be any ticket sales at the event. Please contact Mamta Punjabi at 207-409-5786 for wait list availability. Kids music group will be performing “Sare Jahan Se Acha”. Girish on Violin, Charu on Clarinet, Swetha on Bass clarinet, Aishwarya on Keyboard, Shruti on French horn and Pragya – vocal. Anca Gooje will be performing Indian classical dance, Bharata Natyam. Bharata Natyam is the oldest form of Indian classical dance, more than 2000 years old. Anca was born in Bucharest,Romania and studied Bharata Natyam in India. Anca has performed Bharata Natyam in India and various European countries. Anca also teaches Bharata Natyam here in Maine! Please see her website –www.ancagooje.comfor more information. Bhajan performance by Swan Kirtan. Ashok Nalamalapu and his fellow Swan Kirtan musicians. 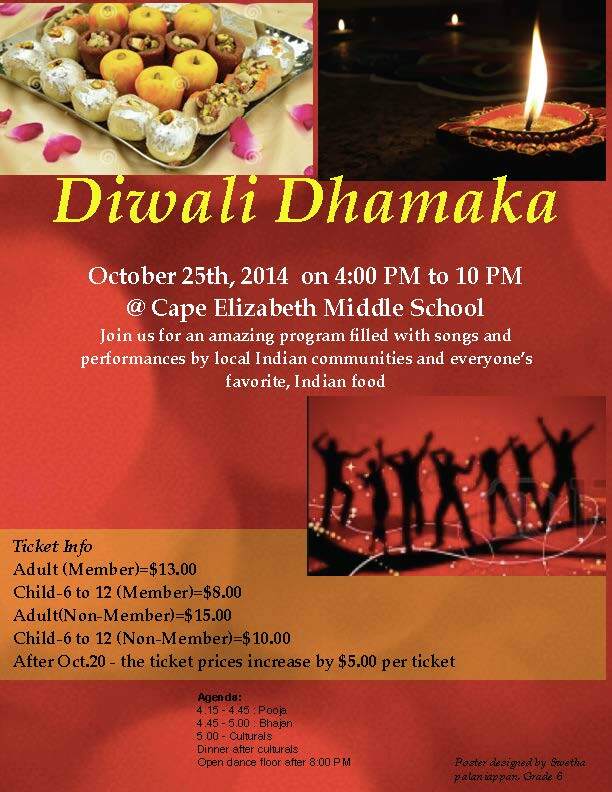 The 2014 Diwali Festival event is on Saturday, October 25th ! Hope to see you all there. There will be performances, food and friends. We also need volunteers on the day of the event, hope you can help to make it a successful community event. Please contact us if you can help. 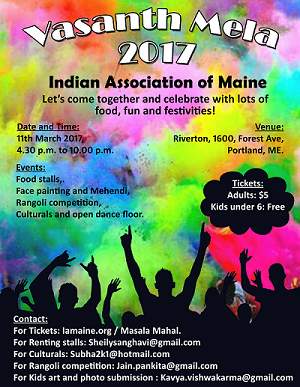 Join India Association of Maine – 2014 and get discounted tickets for the 2014 Diwali and 2015 Spring festivals. Your membership is valid until September 2015.